Pittsburgh, PA (June 1, 2016)–The Pittsburgh Pirates have added GreenDrop Stations to their “Let’s Go Bucs. Let’s Go Green.” campaign. PNC Park and the Pittsburgh Pirates established an environmental sustainability program in 2008 that includes all daily operations. They have now added durable GreenDrop Recycling Stations to support their efforts. ADA-conforming GreenDrop Stations reduce landfill contributions by showing event attendees how to easily self-sort recyclable and/or compostable items out of the landfill waste stream. The Pirates are reducing their environmental footprint while minimizing staffing expenses and being fiscally responsible through sustainable operations. “The goal of the ‘Let’s Go Bucs. Let’s Go Green.’ program is to focus on landfill diversion, resource conservation, and educating PNC Park visitors”, stated Sissy Burkhart, the Manager of Cleaning Operations at PNC Park. “Before this program, there were no set diversion practices so almost all of our waste went to landfills. Today, we are seeing the rewards of our sustainability efforts in supporting our community and involving fans in the process”. Since the launch of “Let’s Go Bucs. Let’s Go Green.” campaign, the Pirates and PNC Park have recycled more than 6 million pounds of material, and successfully diverted approximately 75% of waste away from the waste stream. The PNC Park has recycled 78 Million plastic bottles, collected 644 tons of compostable materials in the 2014 season alone, and used environmentally friendly paper including toilet paper that is made of 100% recycled materials. 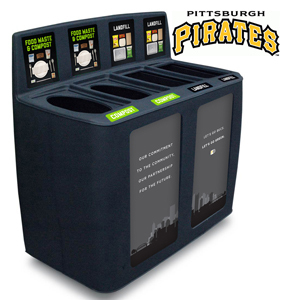 To further increase their sustainability efforts at PNC Park, the Pittsburgh Pirates have chosen to add GreenDrop Recycling Stations to their Executive offices. GreenDrop Stations have worked in other venues of the Green Sports Alliance of which the Pirates are an active member. “Using a composting waste stream option can remove tons of organic material normally going to landfills. That will help slow down the production of methane, a hazardous contributor to greenhouse gas, from entering our atmosphere”, added Burkhart. The unique, market-leading GreenDrop Recycling Station was developed through the multi-year efforts of the Portland Trail Blazers head office and the Moda Center. The arena’s landfill diversion rate increased from 38% in 2007 to over 90% in 2012, in part by replacing old-style garbage cans with GreenDrop Recycling Stations. GreenDrop stations reduce landfill contributions by visually showing users how to properly dispose of recyclable and compostable items. GreenDrops are a key tool in reducing a venue’s environmental footprint through fiscally responsible sustainable operations. Lyle Peters, Director of Sales for the GreenDrop Stations, adds, “The Pirates and PNC Park have been on the forefront of sustainability and environmental education for the past seventeen years. This has been an exciting project for our Pacific Cascade team. We helped with their custom instructional labels depicting specific items to sort and also promote the “Let’s Go Bucs. Let’s Go Green.” campaign. Detailed sorting labels guide guests to quickly and accurately dispose of waste within specific waste streams at one orderly stop. Keeping facility expenses at a minimum. Contact us to discuss how GreenDrop stations can enhance your recycling/composting program. PNC Park opened during the 2001 Major League Baseball season, and is the home of the Pittsburgh Pirates. PNC Park features a natural grass playing surface and seats 38,362 people for baseball. The Pittsburgh Pirates franchise has won five World Series championships since it was founded in 1881. Since 1987, Pacific Cascade has been providing the Parking, Hospitality, Traffic Enforcement, and the Environmental Sustainability Industries with products to manage and support their effective operational needs.